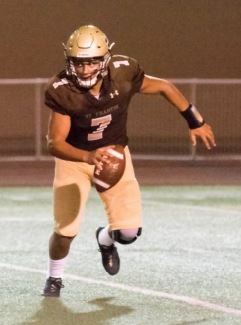 Darius Perrantes completed 10 of 26 passes for 152 yards in the Golden Knights’ 17-13 victory over Saugus. The St. Francis varsity football team came away with a 17-13 victory in a back-and-forth affair against visiting Saugus last Friday. The Golden Knights (2-2 overall record) found themselves trailing 7-0 in the first quarter following two turnovers, including a controversial fumble recovery that was ruled a lateral by the officiating crew. Senior quarterback Darius Perrantes, who completed 10 of 26 for 152 yards, was held scoreless until the 10:27 mark in the second quarter when kicker Jake Smith put the home squad on the board with a 38-yard field goal. St. Francis got into a rhythm offensively and took a 10-7 lead following a 2-yard touchdown run from Max Garrison with 4:04 remaining in the second quarter. Garrison got the home crowd to its feet with a 94-yard kickoff return for a score to open the second half of play, a touchdown that proved to be the game-winner for St. Francis. Saugus (4-1 overall) fought back with a 16-yard touchdown pass from Cole Gallagher. The Centurions missed the point-after attempt but cut the deficit to 17-13. However, any chances of a comeback were thwarted by St. Francis running back Bradley Pierce, who helped his team by converting two of three key first downs that allowed St. Francis to close out the game. The Golden Knights will travel to Studio City to take on Harvard-Westlake in a nonleague game this Friday, Sept. 21, at 7 p.m.